I guess I must have been a good boy last year as Santa Claus gave me a $50 voucher for books. So at the earliest available time I hiked it down to Barnes and Noble with the rest of my family, who also received vouchers from the bearded one (literally in this case), and bought “An Inner Silence, The portraits of Henri Cartier Bresson” along with a copy of Annie Leibovitz at work. Cartier-Bresson has for a long time been a major influence in my own photography. Not just for his street photography, for which he is renowned, but for his portraits as well. So I was really looking forward to spending some time reading the photographs in this book to get a deeper understanding of Henri Cartier Bresson’s style. I skipped the intro by Agnés Sire and Jean Luc Nancy, as I wanted to form my own opinion. I only got as far as the first photo, Georges Rouault, and then ground to a halt. My initial reaction was “what is so special about this photograph?” as at first glance this is not a very complex image. I wondered why it deserved to be first in the book. I needed to find out more. Now I confess to not being a trained artist, classical or otherwise. I am an engineer by trade, and worse still a software engineer. So it is with a bit of trepidation that I write this post. It feels a bit presumptuous to analyse and comment on Henri Cartier-Bresson, one of photography’s masters. However I guess that its through this sort of activity that we learn from him and from each other. So here goes…here is my reading of the photo, step by step as I uncovered what the photo had to offer. At first all I had to go on was that this was a HCB portrait. I did not know the subject, Georges Rouault, from a hole in the head. Hey what do you expect from a software engineer? So lets start with Henri Cartier-Bresson himself. Probably the most famous quote from HCB is “To me, photography is the simultaneous recognition, in a fraction of a second, of the significance of an event as well as of a precise organization of forms which give that event its proper expression.” A quote which has become popularised in the term “the decisive moment”, a term which I believe to be widely misunderstood. More on this later. As a trained artist Cartier-Bresson was well schooled in composition and the geometry of form. As one researches his work one sees repeated use of geometrical shapes, diagonals and curves to link the main elements of the photograph and to create structure and meaning. 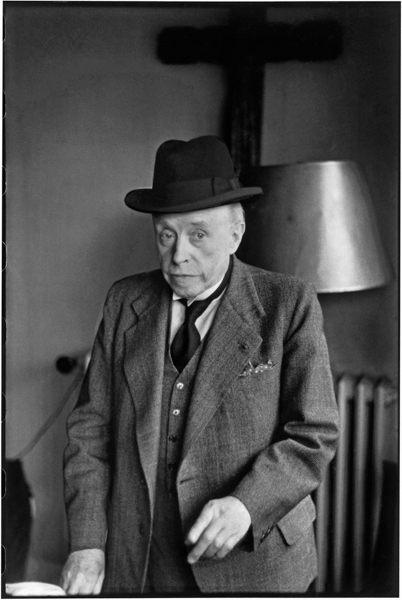 The shapes and lines are frequently repeated in Cartier-Bresson’s photographs. This portrait is true to form. The dominant vertical line is the cross, and it is placed on the golden ratio, dividing the photo into what is known as the Devine Proportion. The vertical is echoed in the grills of the radiator and less formally in Georges Rouault’s clothing. Rouault’s eyes are also placed on the horizontal golden ratio, and that line is beautifully mirrored in the radiator, shoulders, hat and cross. There is a bit of a diagonal going on from the bottom left corner to the top right, but to me it is not as important in the composition as the other lines. Had there been a figure of Jesus on the cross it would have dramatically changed the composition. It would move the eye’s attention from Rouault to Jesus himself. Probably not the ideal outcome for a portrait. The use of verticals and horizontals like this creates a very rigid, perhaps austere mood to the image. The only thing in the composition that feels slightly odd to me is the position of the lamp. Again more on that later. Cartier-Bresson liked to capture his subjects unaware. He stated “Above all, I look for an inner silence. I seek to translate the personality and not an expression”. This does not mean there should be no expression, rather he disliked formal posing in portraits because, in posing, the subject tries to be the person that they want the world to perceive them as, rather than who they actually are. He wanted to capture the essence of the person, formal posing would make this impossible. Moreover, his portrait images are often devoid of objects and artefacts that would detract or from the person. The portrait of George Rouault is a great example of this. There really is only the cross and Rouault himself. But in this simplicity a story starts to unfold. The formality of the composition, the austerity of the scene, the position of the cross and an understanding of how Henri Cartier Bresson went about his work, all suggested to me that religion played a big part in Rouault’s life. To go further in reading the image I had to find out who Rouault was. What was his back story and did it have any relevance to the image. Georges Rouault was a French artist. He started out his artistic life as an apprentice in stained glass and moved from there to the Ecole de Beaux Arts in Paris to study under Gustav Moreau. I won’t go into the detail of his artistic history, you can follow some of the links below for an overview. Suffice it to say that Rouault was a deeply spiritual man, and almost all of his painting dealt with Christ, religion and spirituality. He was heavily influenced by Leon Bloy and Joris Karl Huysmans. Bloy, who left the Catholic faith only to return with gusto at a later age, is said to have facilitated Rouault’s and Huysman’s own re-connecion to their Catholic faith. Around 1916 Ambroise Vollard became Rouault’s sole agent and commissioned Miserere,the work for which Rouault became most widely known. Miserere, which is Latin for mercy, consists of 58 prints all pertaining to human suffering, for in Rouault’s mind it is through suffering that one finds salvation. Heady stuff, but how does it help with the photo. Well first of all it puts the cross and the composition into context. The image is a reflection of the man and his philosophy. There also is a hidden gem. 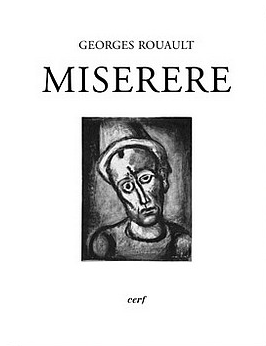 The cover of the book, Miserere, is actually a self portrait of Rouault. There are obvious parallels with the photograph and the expression of Rouault. Amazingly in this one moment, Cartier-Bresson not only captured the personality of Rouault, but tied it directly back to his major work. But what of the decisive moment and the lamp? There is a danger in the term that it is taken to mean that in any given scene there is only one moment worth capturing, and that Cartier-Bresson would only have taken one photograph. This is simply not the case. In truth there are decisive moments happening all around us all the time. What Cartier-Bresson excelled in is recognising when the event or action in a scene combined with the elements in the scene to convey the meaning that he wanted to express. This is the decisive moment. If you look through Magnum photos you will see at least three photos that all appear to come from the one sitting with Rouault, but only one of them became famous. Of the three the one above is the only one that really captures Rouault’s personality and life. On close inspection you will see that the lamp is in different position in one of the photographs. 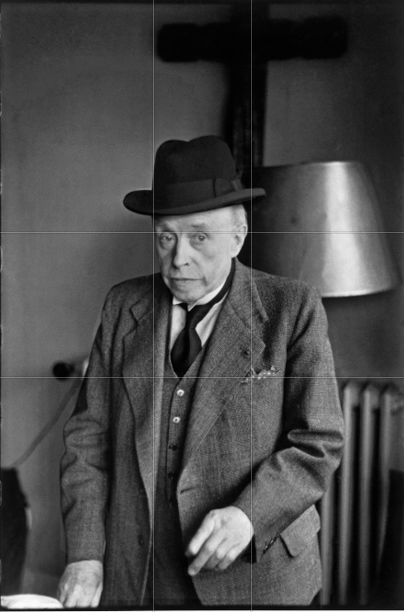 Only in one photo is Rouault wearing the hat, that so neatly ties the image to Miserere. Was this posed? Without looking at the shot sequence I can’t answer that but in keeping with the reputation of Cartier-Bresson I like to think that this truly was a decisive moment. As a fan of HCB I can state without reservation that this photo is a poor example of his work. Rule of thirds non-withstanding. Every photo on my own website is superior. No brag, just fact. 🙂 Not to suggest I’d go photo to photo with HCB, except in this case. Hi dan, thanks for commenting. I look forward to looking at your photos. In investigation this image I am not holding it up as a great example of his art, merely I was surprised to see it as the first in a curated set of images and I wanted to understand why it may have made it off the editing table. I really appreciated your post, that by the way describes very well the steps that I also followed while investigating Rouault portrait. Except for the “hidden gem”, for which I thank you. Your opinion on this would be welcome! Well written analysis which put the subject of the portrait into context. Thanks for your comment Doublewhirler. I have always found this portrait to be a little bit cumbersome, but it was fun digging into the background. Interesting, thanks for sharing your thoughts about this photo. Thanks Robert. I learned a lot from doing the research and from response on the rangefinder forum.